There are showers and some fog to start this Friday, and this morning may be the warmest part of the day. A cold front will be moving through later this morning across metro Baltimore. A little later for the Delmarva. The winds will shift, and temperatures will hold steady or drop this afternoon. Then much colder air on the way this weekend. This will set up a two part winter event for Monday and Tuesday. I’ve packed a lot of maps below to help break this down. I will have more details on the storm beginning in my evening report. Maps for these events are below. Today: Morning showers. Temps falling this afternoon. Weekend: Mostly dry and cooler. Saturday may stay below freezing for most of the region. Wind chills in the teens and 20s. Sunday overnight into Monday Morning: Some light snow. Is it too early to get excited for a winter storm? This thing has not formed yet! So the location and timing is up for debate. 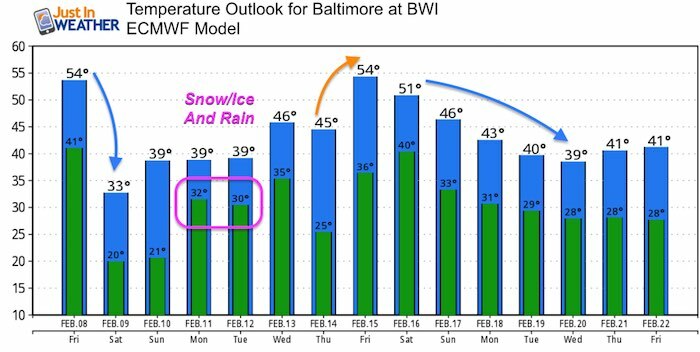 Agreement: Some snow Monday, but then more impact snow and ice on Tuesday. The timing of the heavier snow, ice, and rain I what is not locked in yet. Monday morning mainly north of Rt 50. Then thawing. Tuesday morning. The second event could lead to more ice into the afternoon and evening in the colder northern counties. This models shows the impact from snow extended farther south to include metro Washington, Annapolis, and Southern Maryland. The accepted solution now: Light snow may impact Monday morning. Then a break and maybe a thaw, followed by a second round of snow and ice Monday night into Tuesday. Freezing line? How far south may be impacted is still up for debate. If you are near or north of Rt 50, there is better reasons to expect an impact. Metro Washington, Annapolis, and southern Maryland to Delmarva should watch updates for any wiggle room. Ice Lingers Longer: Colder zones NorthWest of Baltimore may hold the ice longer into Tuesday. Models often bring in a thaw too early with this type of set up. How Much Snow? It is too early to say, especially since we don’t have a lock on the freezing line or transition from snow to ice. The Canadian Model shows more impact farther south. 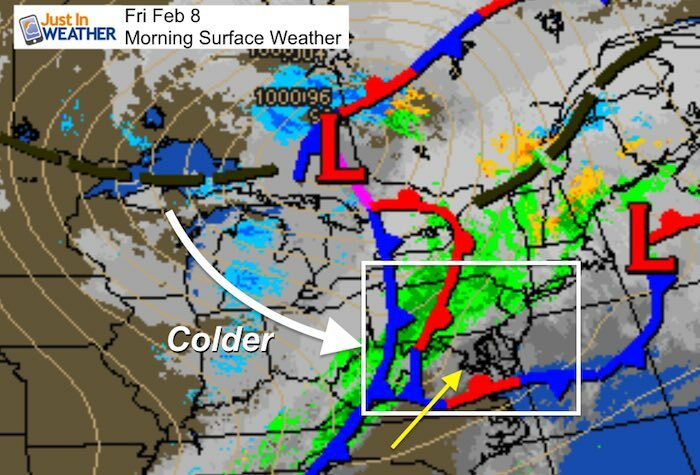 This shows the freezing line closer to Rt 50. Notice the ice lingering longer in northern Maryland and southern PA Tuesday evening. Monday and Tuesday: The model shows highs above freezing, but look at the lows at 31ºF. Looking deeper, this model supports the snow with colder temps Monday night into mid day Tuesday. So the highs are before and after the snow portion shown in the slider above. Warm up after Valentines Day, then colder again.